• USB Charging Range : Phone, Pad, Pod, PDA, MP3 etc. 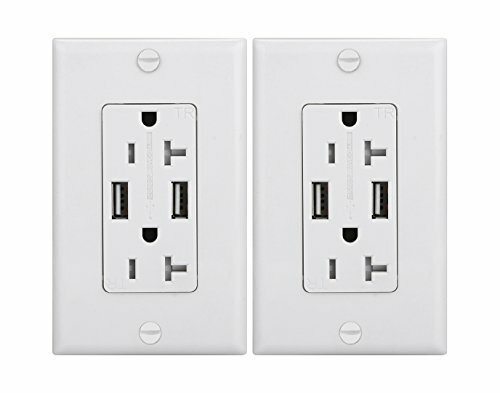 Dual USB Charger/Tamper Resistant Receptacle offers two USB charging ports and duplex Tamper-Resistant receptacles. It is an ideal solution for creating a centralized mini charging station for commercial and professional workplaces as well as high-end offices and houses. You can charge two devices simultaneously using the two USB ports and leave the two receptacles free for your other power needs. Install it in your garage, living room, kitchen island, and any other room to make charging fast, easy, and convenient. Create power charging centers throughout your office or home and keep your rooms looking clean and tidy without large power adapters. 2. Smart USB outlet design makes you more convenience to charge your device under smart and safe mood and without any adapter. 3. There is the children protection design (TR design) to avoid any risk happen. 5. 2 years warranty and ETL certified safety. If you have any questions about this product by ANBOTER, contact us by completing and submitting the form below. If you are looking for a specif part number, please include it with your message.